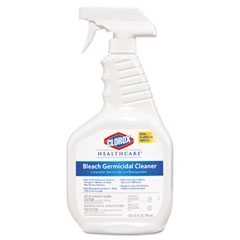 Clorox Healthcare germicidal disinfectant bleach in 32 oz. trigger spray bottle. Unique, stabilized bleach & detergent solution that’s cleans and disinfects in one step. One-minute efficacy on germs and viruses.